I will tell you right up front that Tastes Like Travel is from Texas, and in Texas there is a Barbecue Restaurant in every city. 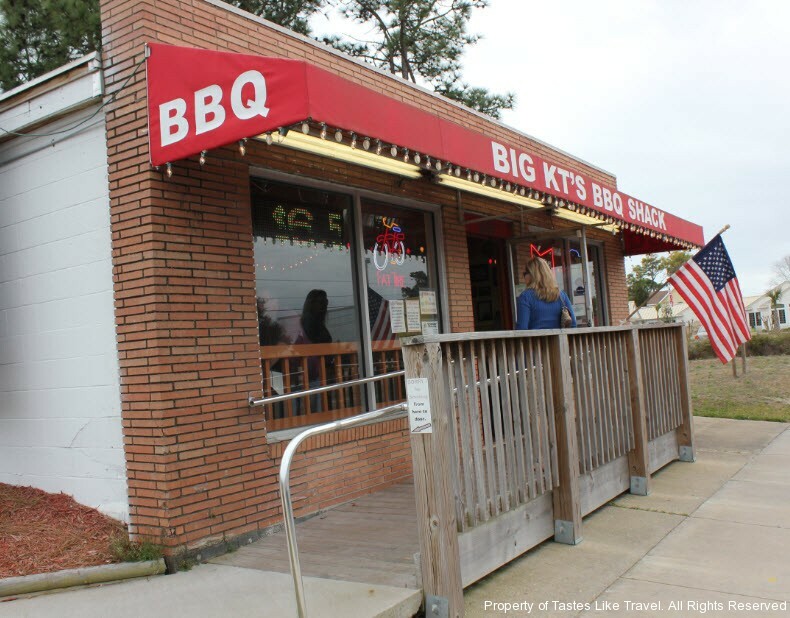 If you are from Texas you know that finding good Barbecue is not that hard. In California that is a totally different story. 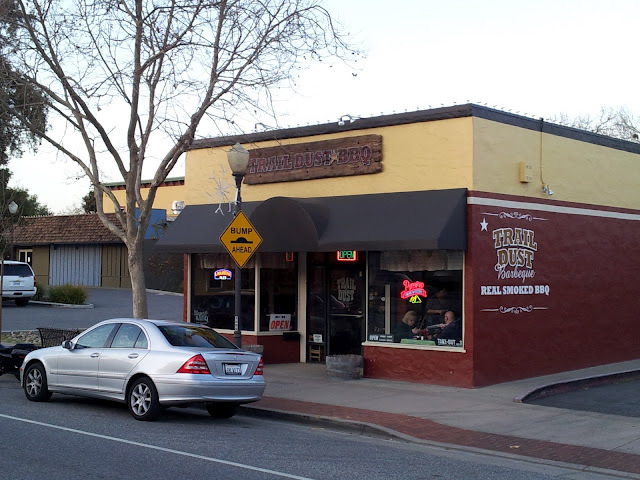 Recently on a 12 day trip to California the only Barbecue Restaurant I saw the entire trip was the Train Dust in Morgan Hill California. On our last evening in San Jose, my cousin suggested we take a 20 minute drive East to the small town of Morgan Hill. He said ” there is some good Barbecue there you ought to try”. I reluctantly said OK knowing my history with out of State Barbecue has not been good. Morgan Hill was a quaint little town and was bustling with several restaurants and shops. It was the kind of town I would like to explore when time permits. Right in the middle of Downtown was Trail Dust Barbecue. THe restaurant itself was not very big. There were no more that 12 tables in the restaurant. When we arrived the place was about 60% full, but is was only 6:00 p.m. We were immediatly seated and presented a menu. Everything on the menu and in the store screamed Texas Barbecue. The tasteful decor was complete with license plates from Texas And Oklahoma as well as other memorabilia. 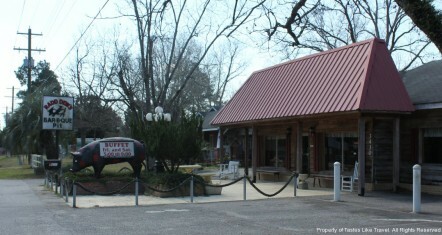 The menu had dishes of Ribs, Pulled Pork, Barbecued Chicken and meat combo platters. The only truly California item was the Tri-Tip. 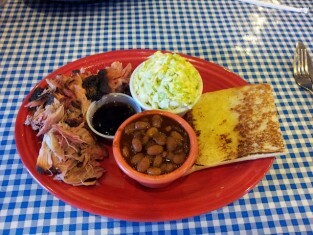 I ordered the Pulled Pork and my guest had the Ribs and Beef combo plate. The Barbecue was truly delicious. It had the tell tail smoke ring on the meat and the taste was distinctly Oak Smoked. Trail Dust boast that they dry rub their meat and smoke it indirectly over indirect heat with Oak Wood. Snooping around after I ate I walked behind the Restaurant and saw their smokers. A sing on the fence said “No Video or Photos” When the restaurant is that careful about their food and smoking technique it has to be good. A sign in the window and information on the menu states, “All Menu items Will Sell Out. I have no doubt that this is true. I personally like the taste of the meat without Barbecue Sauce, But I tried their sauce to see how it tasted and it was very good. 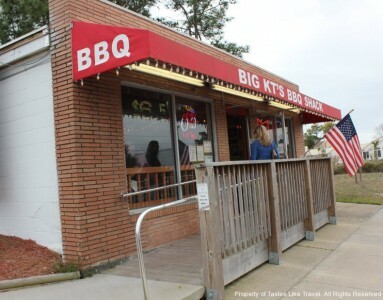 I can honestly say this is the best Barbecue I have ever eaten in California. 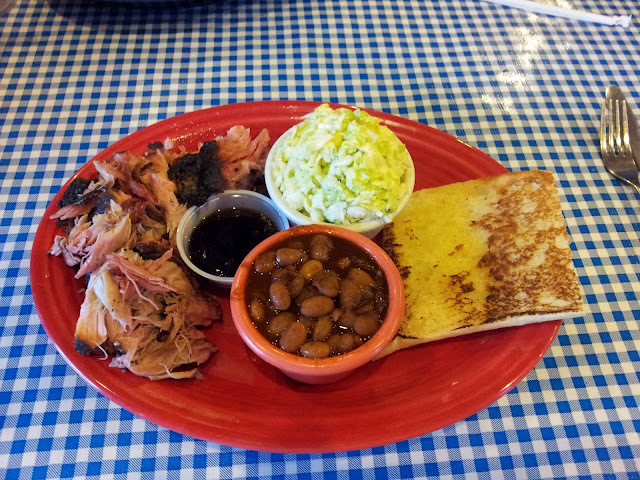 Tastes Like Travel highly recommends a trip to Trail Dust Barbecue. If your from California it will be a great meal, If your from Texas it will remind you of home.